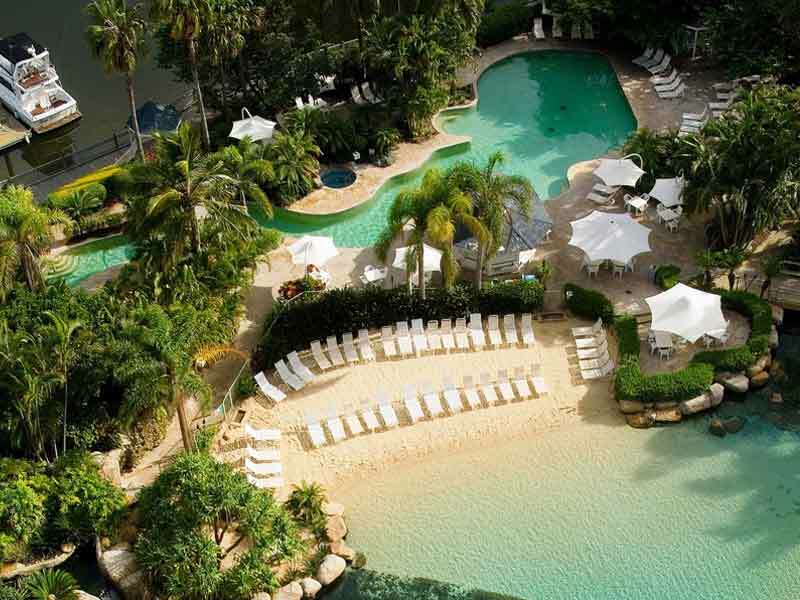 Treat yourself to pure Gold Coast luxury at the Surfers Paradise Marriott Resort & Spa. 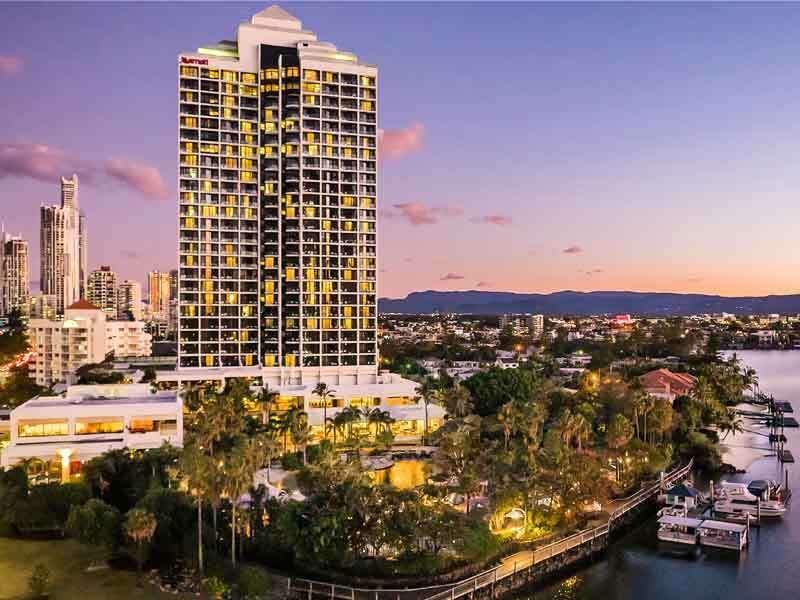 Situated just minutes from the beach and near beautiful canals, this resort is the perfect mix of sophistication and convenience—an unforgettable experience in the heart of the Surfers Paradise! 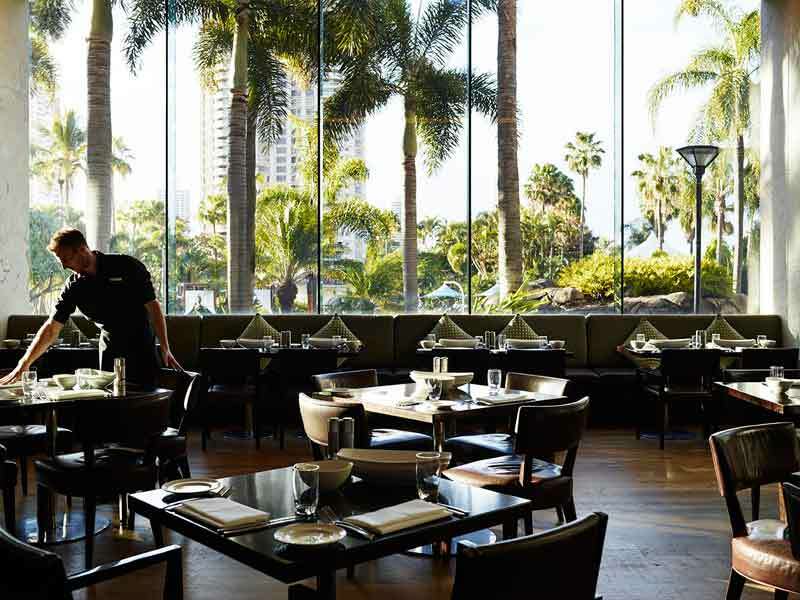 The Surfers Paradise Marriott Resort & Spa offers quiet luxury, despite its central location. This award-winning resort has coupled intuitive services and blissful accommodation to provide the perfect Gold Coast escape for anyone looking to take resort life to the next level. 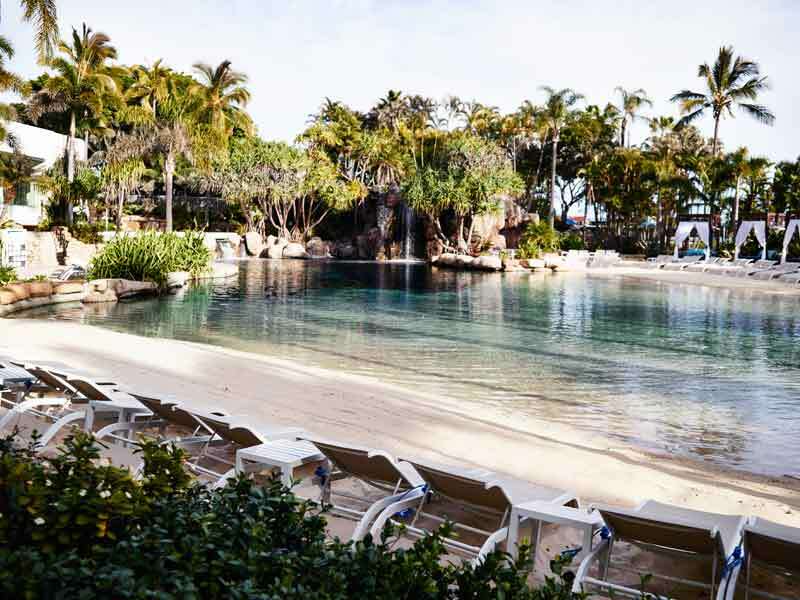 An $8 million aquatic playground is the centrepiece—with 2 pools, cascading waterfalls, a saltwater lagoon and sandy shore, plus an array of tropical fish in a living reef, you can splash, soak, or snorkel without ever having to leave the resort! There is a full service day spa onsite, a barber/beauty shop, a 24-hour fitness centre with complimentary sauna and spa, and outdoor activities, including tennis courts and bike rentals! Enjoy the Surfers Paradise Marriott with your family, or take advantage of the Kid’s Activities Centre for a bit of alone time. The Centre is available for children from 4 years old and, while the kids are entertained, you can enjoy the rest of the resort, including 4 restaurants and lounges and a poolside bar with cocktails and light meals! 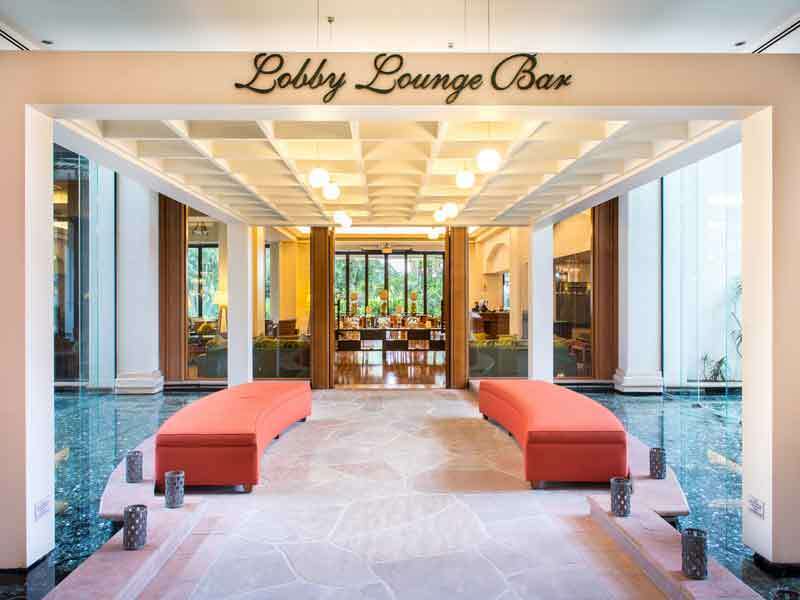 The resort also features an ATM, florist, gift and newsstand, laundry services, valet dry-cleaning, and Grab-n-Go breakfast, and 9 meeting and event rooms catering for up to 800 guests! 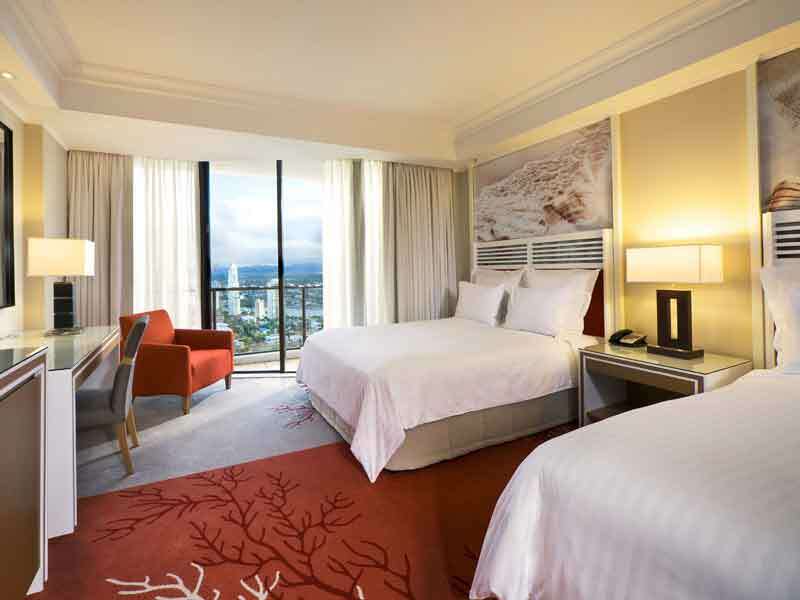 Why go to Surfers Paradise Marriott Resort & Spa? The Surfers Paradise Marriott Resort & Spa definitely lives up to the Marriott’s reputation. 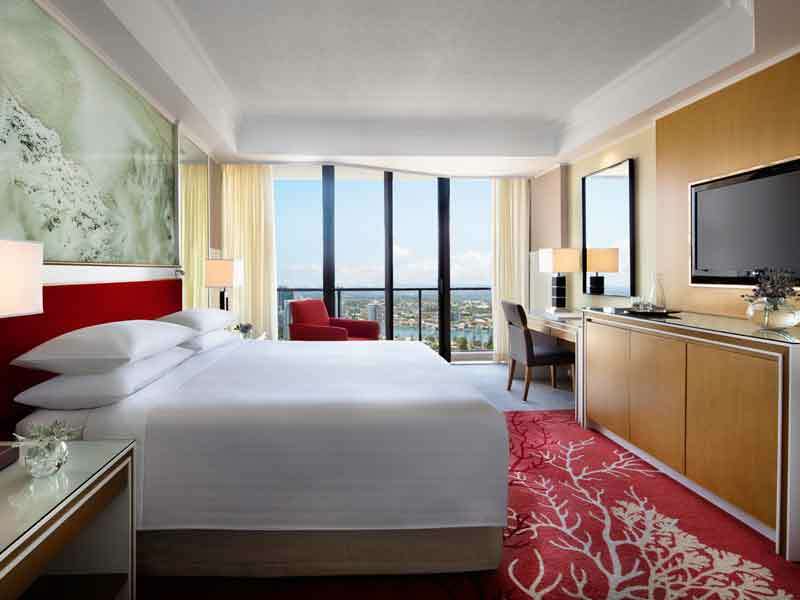 Each of the 329 rooms are elegant and airy and feature floor-to-ceiling windows that showcase breathtaking views of the Gold Coast Hinterland, Surfers Paradise skyline, or the Pacific Ocean. The aquatic playground features 2 pools, cascading waterfalls, a saltwater lagoon and sandy beach, whirlpools, spas, saunas, plus a live tropical reef, filled with fish for guests to snorkel amongst! 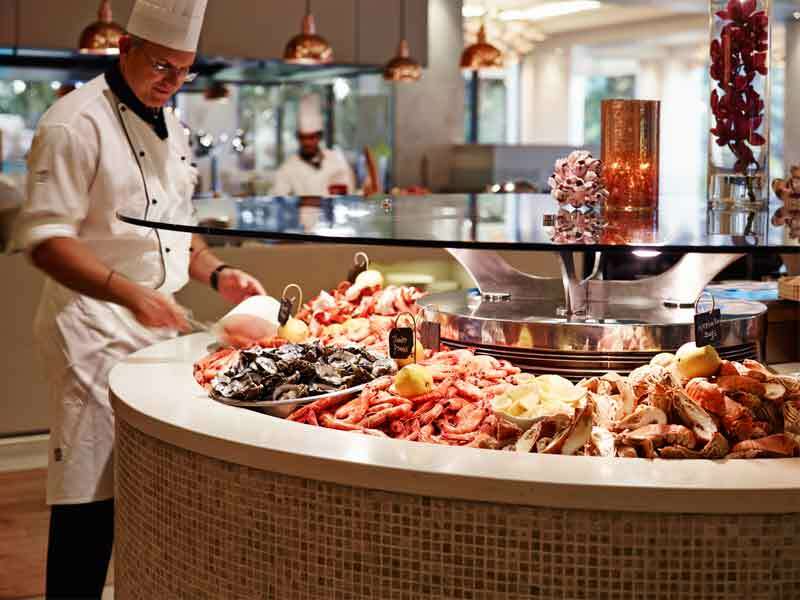 There’s multiple restaurants and bars plus a whole host of other facilities to make your stay a memorable one. See and do it all and make unforgettable memories when you stay at Surfers Paradise Marriott Resort & Spa! Enjoy stunning views of the Gold Coast Hinterland from this elegant Mountain View room. This 42sq. 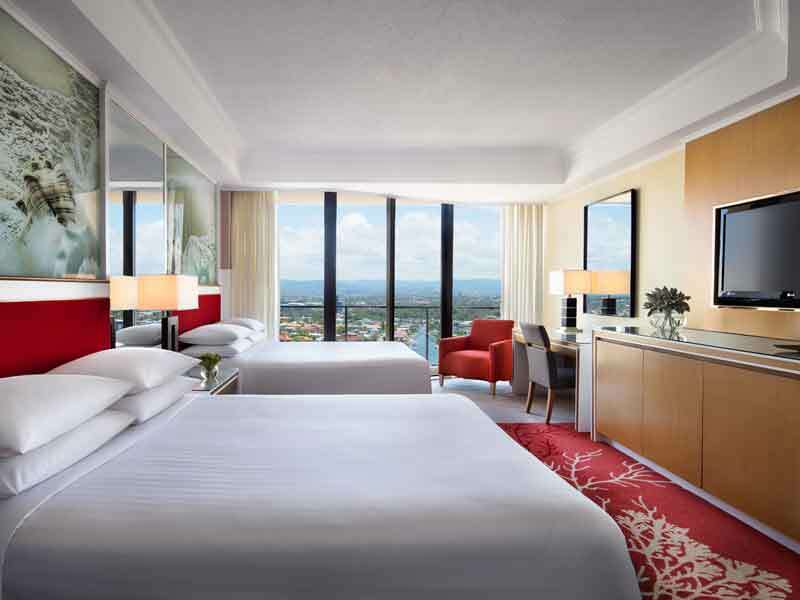 metre space is air-conditioned for your comfort and includes either 1 deluxe pillow top King bed, or 2 Doubles. Enjoy floor-to-ceiling views and 6sq. metres of outdoor space, or close up the windows for soundproofed privacy to rest easy at night. These rooms feature beautiful marble bathrooms with separate showers, bathtubs, and lighted makeup mirrors, 2 robes and slippers, writing desks, ironing facilities, a mini-bar, coffee and tea makers, free Wi-Fi, and a 42inch LCD TV with premium movie channels, cable channels, and pay-per-view options. Room service is available 24-hours so you can really settle in and enjoy the space! 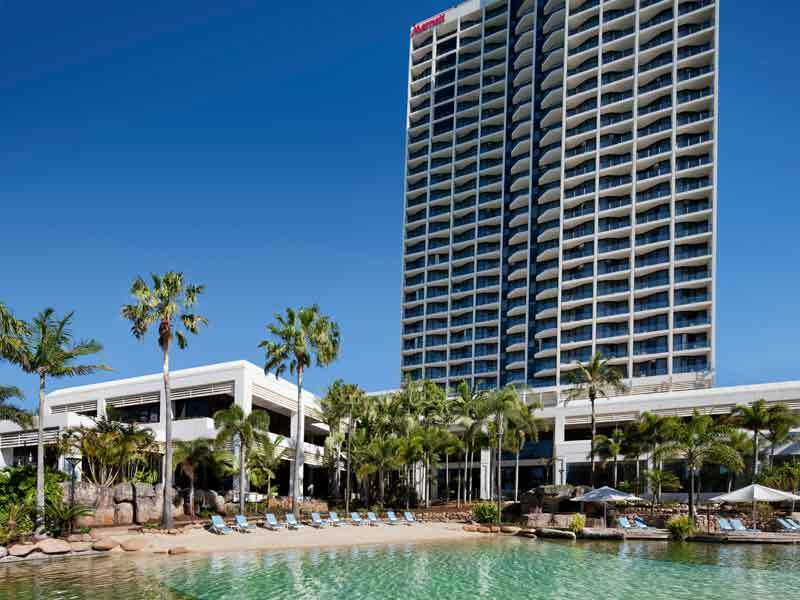 The Surfers Paradise Marriott Resort & Spa is approximately 23km from the Gold Coast Airport. 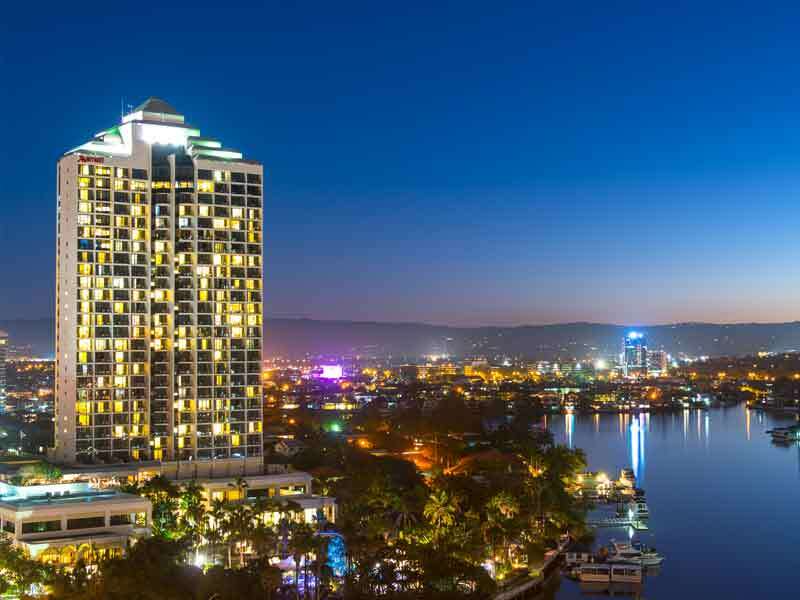 Set just to the side of Surfers Paradise, a short 1km journey will get you to major shopping precincts, activities and restaurants, plus the resort is set just 200m back from the beach! 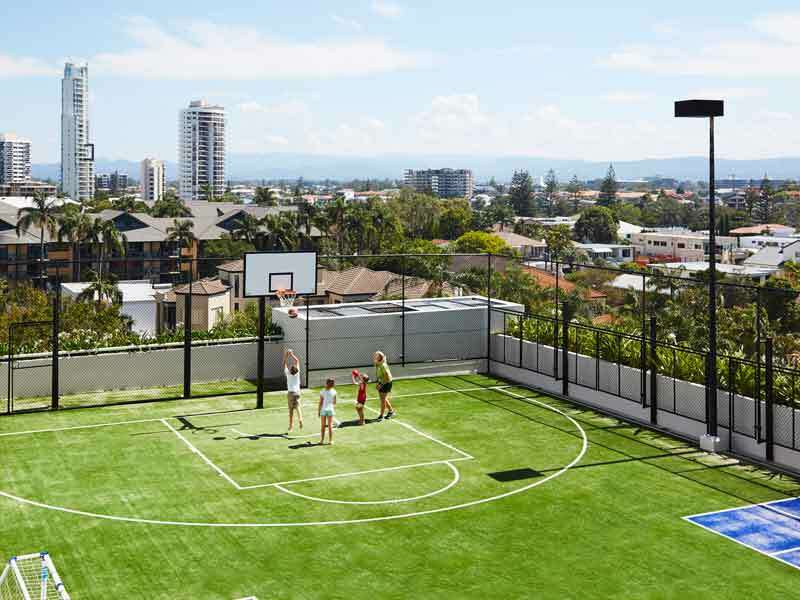 The opportunities for things to do in and around Surfers Paradise Marriott Resort & Spa are almost endless. The Ruby Spa offers luxurious treatments such as body wraps, massages and beauty treatments. If a spa treatment isn’t your idea of relaxation, then spend the day by the poolside. There’s also a fitness centre for our active guests to utilise. Thanks to the central location, there is plenty to do outside of the resort too. Surfers Paradise beach is less than a block away and the hub of Surfers Paradise is just down the road. You’ll find a range of restaurants, cafes, bars, clubs, shopping, activities and attractions all around Surfers Paradise. Take the 15 minute drive to SeaWorld and discover the Gold Coast marine world or drive a little further to the best theme parks in Australia. The whole experience was seamless, organised, and enjoyable. From check-in to check-out we felt taken care of and were able to relax in a beautiful clean, luxurious hotel. Highly recommend for those visiting the Gold Coast.